Sowat 85% van alle amputasies van diabete se voete en bene begin weens die swak versorging van ‘n ulseratiewe wond wat onstaan as skaafplekke, blase, eelte en klein seerplekke of drukpunte op die voet nie onmiddellike en ernstige aandag van die pasiënt kry wat hom/haar onmiddellik na die dokter of opgeleide verpleegkundige wend nie. As jy ‘n diabeet is, MOET jy jou voete met groot aandag versorg as jy ‘n voet- of beenamputasie in die toekoms wil voorkom. Dis grootliks in jou eie hande. Marí Hudson het met prof. Gary Sibbald [BSc, MD, M.Ed.,D.SC(Hon), FRCPC (Med)(Derm), FAAD, MADWCA, JM], professor in Interne Geneeskunde en Openbare Gesondheid van die Universiteit vanToronto gesels oor diabetiese voetsorg, omdat die verwaarlosing van dié toestand wêreldwyd – en veral in Afrika en ook Suid-Afrika – ‘n groot bekommernis vir dokters is. Is jy ‘n diabeet? Versorg jy jou voete voldoende om eendag ‘n amputasie te voorkom? Lees en kyk verder. Sigarette – los, want dit verswak die bloedvloei na jou bene en voete. As jy oorgewig is, verloor daardie ekstra gewig, en oefen 5 keer per week 30 minute per sessie, en drie keer per week kragoefeninge. Skoene en kouse – dit mag nie te styf sit nie, jou tone moet teen niks druk nie en jy moenie skaafplekke of blase of eelte vorm nie. Onder ‘n eelt kan reeds ‘n wond wees. Moenie kaalvoet loop nie. Temperatuur – Meet die temperatuuur van jou vel op 5 plekke onder jou voet met ‘n infrarooi-termometer. Dit moet nie op een van die plekke meer as 38 grade Celsius wees nie en ook nie op een plek meer as 1.5 grade Celsius hoër as op die laagste meting nie. Voetdruk – Maak seker jy het skoene wat nie aan jou tone druk nie, ook nie skaaf of blase laat vorm nie. Kry ‘n wyetoonskoen, en stutte binne-in jou skoen sodat die druk oor jou hele voet versprei en jy nie blase en eelte vorm nie. Pols – voel die voetpols om seker te maak daar is voldoende bloedvloei na die voet. Skraap – die harde eelte moet weggeskraap word, maar slegs as daar voldoende bloedvloei na die voet is. 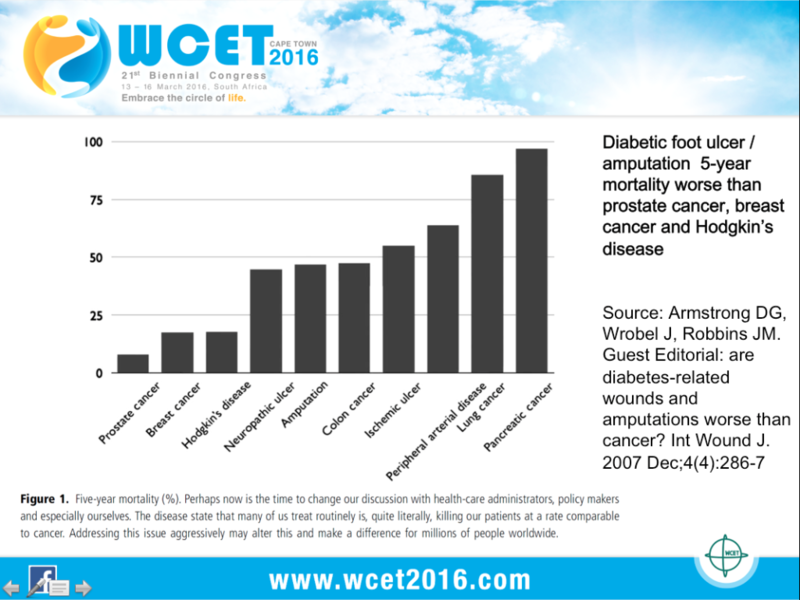 Diabetes is the major cause for lower limb amputations in the world. 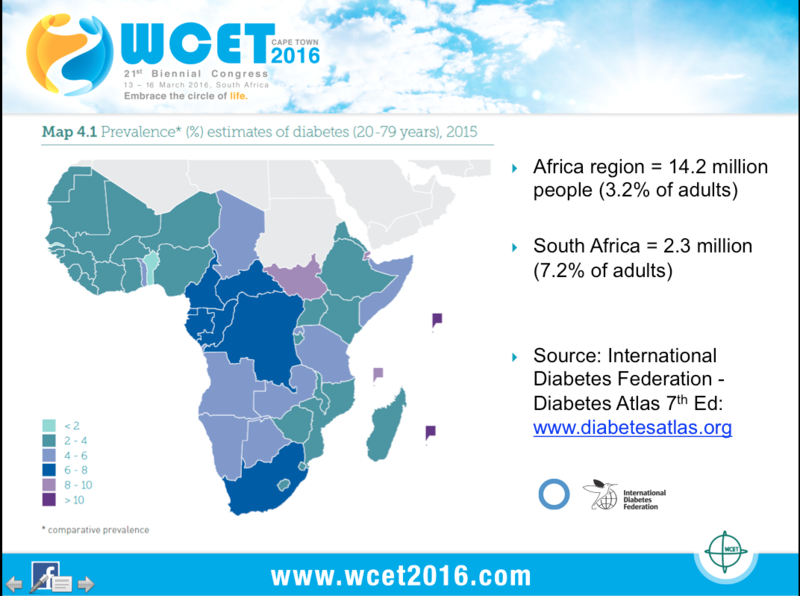 Africa has the highest percentage of undiagnosed diabetes worldwide. 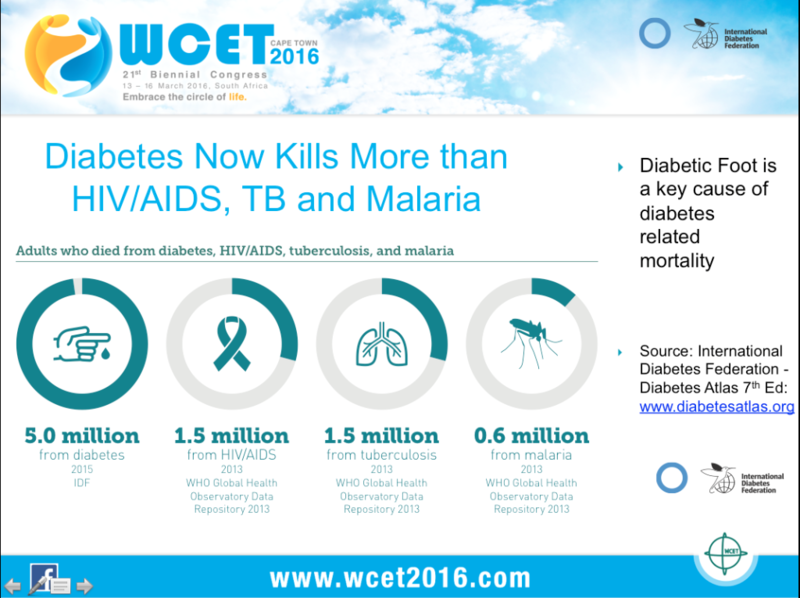 Persons with diabetes in Africa also have the lowest chance of high risk diabetic foot screening. Undetected diabetic foot complications, including preventable loss of limbs and lives2, are due to the lack of gold standard care. We, the combined voices of WoundPedia, International Interprofessional Wound Care Course, World Council of Enterostomal Therapists, the Pan-African Diabetic Foot Study Group, Santé Diabète, T1International3, Wound Healing Association of Southern Africa, International Interprofessional Wound Care Group, International Diabetes Federation and the Pan-African Diabetic Foot Study Group gathered together in Cape Town, South Africa, call for the implementation of evidence informed interprofessional diabetic foot care. We endorse and recommend the 5 S’s and VIPS of diabetic foot care for all of Africa. This is an extraordinary challenge and achievable goal with millions of lives at stake. We call for all to endorse this declaration. 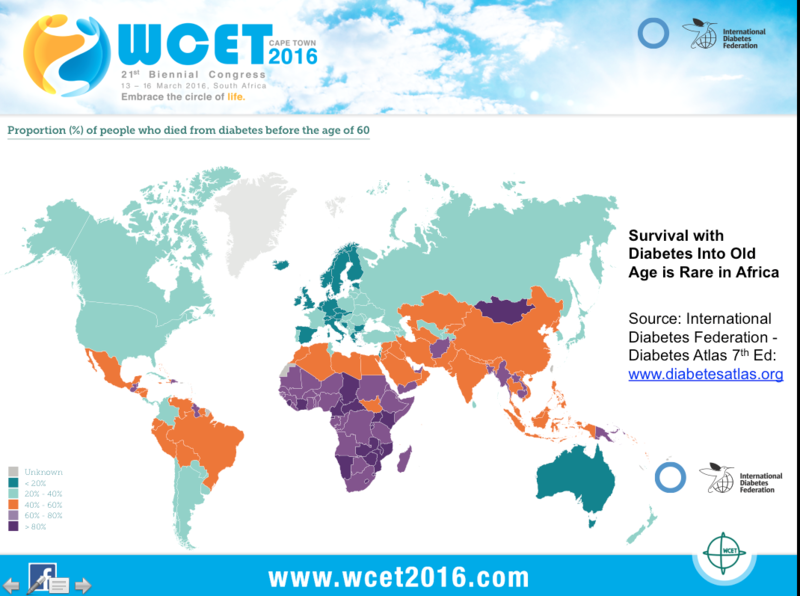 People with diabetes are dying in Africa because they cannot afford or access insulin. This is despite nearly 100 years having passed since the discovery of insulin by University of Toronto researchers, who all wished for universal access. Most Africans also do not have the medical supplies, education and monitoring needed to use this life saving medication. One in two people who need insulin cannot afford it. Over the next decade, many of the over 22 million Africans living with diabetes today will die predictable and avoidable deaths without insulin treatment. We, the combined voices of Santé Diabète, T1International, WoundPedia, the International Interprofessional Wound Care Course, the delegates of the World Council of Enterostomal Therapy, the Wound Healing Association of Southern Africa, the Pan-African Diabetic Foot Study Group, International Interprofessional Wound Care Group and the International Diabetes Federation gathered together in Cape Town South Africa and resolved that we cannot accept that diabetes has now surpassed malaria, tuberculous and HIV/AIDS as a leading cause of adult death in Africa. We want everyone with diabetes in Africa to have access to affordable insulin and injection devices. We call for the World Health Organisation to announce a goal of universal access to insulin treatment. We launch this plea in the same spirit as the 2002 Cape Town Declaration of Action for HIV/AIDS access that has saved millions of lives. Our task force and international allies will hold governments, international agencies, donors, the pharmaceutical industry and the private sector accountable for universal access to insulin in Africa. This is an immense challenge with millions of lives at stake. This is an achievable goal. We call for everyone to endorse this declaration.